More than ever before, the importance of effective team management, team bulding and team collaboration has reached an all-time high. The impact of accord or discord between team members as well as teams and management can be reflected in the projects and daily workflows. According to PMI, only 56% of strategic initiatives meet their original business intent and goals. It is more alarming when combined with the following statistic: 97% of employees and executives believe lack of alignment within a team impacts the outcome of a task or project. This shows how critical effective team management is. Here is our list of 20 of the top team management software. Although most of these come as complete project management tools, we will be highlighting their key team management modules or features. nTask is a comprehensive tool that is designed especially for Agile Teams. Comprising a number of modules and features devoted to Task management, project management, issue management, risk management, meeting, and team management, it provides all possible solutions for any business under one roof. Allows early issue tracking, with issue status, priority and task linkage. Looking for a perfect team management tool? nTask is free and lets you create & manage unlimited tasks, meetings, issues, risks and more. Bitrix 24 is a project management software that provides an entire suite of team collaboration, communication and management features for your team. Accommodates up to 12 free users. Allows subscriptions to groups or discussions. Social search including events, tasks, and uploaded documents. Tempo is another top team management software that helps you manage your team in multiple ways. It offers solutions for managing projects and teams through drag and drop. Team management by roles, capacities, start and end dates, workload and holiday schemes. Link Jira boards and projects to teams for backlog definition. Apply custom work and holiday schedules. Access a timeline with your team and their backlog in parallel. Plan work through drag and drop onto the timeline. Scoro is a complete business solution laced with modules that cater to team management, project management, and customer relationship management. This top team management tool is equipped with all the necessary tools to provide solutions to your business needs. An all-in-one tool ranging from document management and project completion to invoicing, billing and client management, it helps you make use of all the powerful features along with a robust collaboration feature set. Teams can keep productive while collaborating on all levels including idea management, information sharing, team reporting, meeting management and resource balancing for workload assigned to teams. With such a comprehensive set of features, this top team management software is growing in popularity with teams and organizations across various industries. Previously known as Dapulse, Monday is an efficient collaboration and communication application for teams. It provides project and task management features as well as facilitates team collaboration and management. Clarizen is a project management tool that provides robust features to boost collaboration and workflows, making it one of the top team management software. Smartsheet is a web-based tool for project management, team task management and more. Comprising a wide set of features to facilitate workflow and project deliveries, it caters efficiently to team management as well. Flowdock makes it to our list of top team management software due to a clean interface, simple yet powerful features, and great collaboration options. With Flowdock, you can manage your team with centralized and open communication and options for multiple integrations. The best part – work is anything but boring with Flowdock as it lets you add custom emojis and GIF images from Giphy to make work and collaboration full of humor and fun. Plus, you have a Team Inbox that lets you save all your discussions and conversations that can be accessed by all team members. We consider Quire one of the top team management software for a number of reasons. It gives you a myriad of options for managing teams and projects. Although most of the features focus on creative teams, it proves as an asset equally to teams in other industries as well. Whether you want to jot down ideas or implement them making use of unique tree structures, it allows you to simplify complex projects into easy chunks of work through unlimited tasks and subtasks. What’s more? If you love Kanban boards, this tool will easily help you design your workflow through Kanban. Customer Support is a pivotal area for any industry. TeamSupport is an online, cloud-based app that helps you manage various aspects of customer support. With functionalities such as an internal centralized communication chat channel, ticket management, contact management, live chat, and customer self-service portal, this top team management tool is ideal to work with support teams even based remotely. TeamSupport lets your team interact efficiently with other teams including sales and finance to better carry out customer support responsibilities. Compatible with iOS, Android, BlackBerry, and Windows Phone. 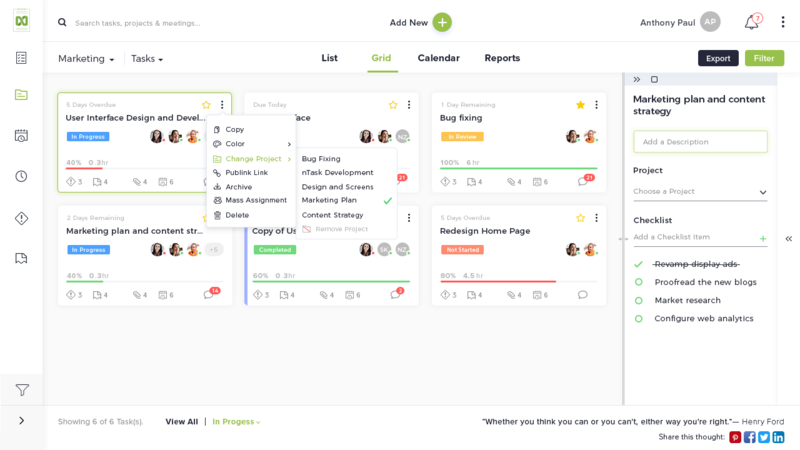 Another Kanban based software app, Kanzen makes use of Kanban boards in order to facilitate project management and keep work transparent amongst teams. Kanzen is a part of our top team management software list due to a feature set that helps teams collaborate efficiently keeping workflow crystal clear and to the point. Teams can share information and files, send and receive notifications, assign tasks and customize their Kanban interfaces with a few clicks. This tool helps teams stay creative and versatile through multiple options for task and project management including configurable card templates and analytics. When it comes to team management, catering to popular Agile frameworks is a plus point for an online tool. Hygger helps you adopt the Agile practice into your workflow by letting you design projects and team collaboration along the lines of Agile frameworks. Following the approach Scrumban, which combines optimal aspects of Scrum and Kanban, this top team management tool lets you stay on track with transparent team management. From tools that allow you to jot down project ideas to modules and features that cater to issue management, task and project management, time tracking and customer feedback, Hygger is your all-in-one tool encouraging effective team collaboration for timely project delivery. The best part – teams and individual users are able to work simultaneously on multiple projects or even combine projects without affecting any part of the project development cycle. Reporting: Burndown report for Scrum and Cycle Time for Kanban real-time monitoring for a release. Teamweek is a project management and team management tool that will help you sort your resources and monitor your workflow visually. You have options such as capacity planning where you get to monitor your team and modify it according to your requirements. You can view roadmaps and with the shared timeline option (which is downloadable as pdf), your team can stay on the same page regarding project updates and other information thereby giving way to more streamlined collaboration. Plus, with teams that require versatile plans for holidays and workdays, Teamweek helps you customize holidays and establish milestones as needed. You can also view your long-term plan by reviewing work annually. #14 on our list of top team management tools is Slack. Growing immensely in popularity over the years, this app can be integrated with your existing task and project management tools. You can create tasks and projects in other tools such as nTask and have team members notified on Slack regarding the creation of tasks and projects, status updates and other alerts in the corresponding tools. So, it works both ways. You can create communication and collaboration channels, opening doors for one on one private chat as well as group discussions. You can also upload files and search for important elements and shared files in individual or group conversations. With the option of inserting emojis and attachments, Slack becomes a powerful yet fun collaboration tool for all types of teams. Asana is a popular task and team management tool that continues its reign in the field of project management. This top team management software offers a broad spectrum of features related to project management as well as a team collaboration and management software. Customize task management and project delivery by organizing and prioritizing activities according to your project requirements and team sizes. Your team can collaborate seamlessly through a multitude of features such as letting team comment on tasks, ‘like’ tasks, assign tasks, monitor different activities and their progress by team members, and keeping a centralized view on teams through ‘My Dashboard’. Wrike needs no introduction and is rightfully one of the most successful project management and top team management software available to project managers. With a sleek interface hosting a multitude of features for streamlined project delivery and team collaboration, this top team management software is an asset to project management teams on all levels. Make sure to keep your team on the same page and their workflow managed appropriately with Wrike in order to facilitate timely project completion. Plus, it gives you a number of subscription plans to accommodate your team size. Proworkflow is a single tool that helps you manage tasks, projects, teams, and resources via a single dashboard in a way to extend more flexibility to workflow and resource management. This top team management software offers a vast array of characteristics including activity management, templates to customize your workflow, timesheet reporting to track time and expense on activities, as well as messaging and document sharing to facilitate team collaboration and communication. Furthermore, keep more in control with the finances through the quotation and invoicing management modules. Basecamp can be termed as one of your top team management software due to the vast collaboration abilities it lends to its users apart from its project management features. With channels for task assignment, instant messaging, real-time chat with groups and individuals, document sharing, and automatic work reports, it gives users to stay on track with project progress individually and stay in sync as teams. Plus, the teams get notified on all updates on a central page and through a feature called ‘Check-in questions,’ the team members can provide status updates on a daily level without having to arrange time-consuming meetings. In essence, Basecamp keeps your team productive and projects streamlined without the hassle of incorporating multiple tools. RingCentral Glip or Glip is yet another versatile, cloud-based project planning software that helps you keep team management under control. It incorporates effective team management into task and project management features through multiple options with tasks and projects. For instance, you can assign created tasks efficiently, share documents and files, schedule project deadlines and track project progress while keeping the team in the loop. Team members can converse with each other with an option of assigning tasks within the conversation. Plus, you can keep a history of conversations to refer to later if needed. There are also contact management and screen sharing options for training and meetings. Fleep is a simple yet fun to use team collaboration and communication tool. You can use Fleep as your team management tool within a single team, across various teams in an organization or with remotely based teams. Focusing more on effective communication, it offers the needed feature set for keeping teams on the same page via features such as file drawer for each conversation where concerned team members get to store and manage files, tasks to create, search, assign tasks and a pinboard along each conversation for adding additional information to a conversation such as meeting notes, links and other important details. Which software and tools land on your list of top team management software for small teams? Let us know in the comments.